Award-winning long-form journalist Eva Holland had always felt that her deepest fear was the death of a loved one. When her mother suddenly passes away, she’s sent spiraling into an odyssey of confronting fear itself. 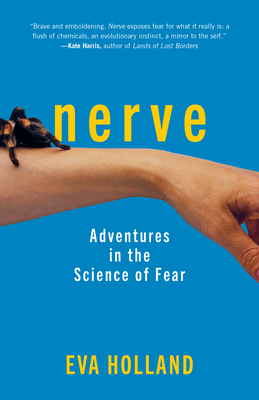 Along with investigating the science of fear, Holland uses herself as a test subject, jumping out of airplanes, rock climbing, and delving into her fears of loss to better understand what her research in the science, medicine, and history of fear reveals. Along the way, Holland meets the scientists who are developing a pill to leech the fear and horror from traumatic memories, and seeks out the sufferers of a rare disease that prevents them from ever feeling fear. She sifts through what we know about the dynamics of how fear spreads in a crowd (and, too often, how it metastasizes into anger and hate). And she applies what she learns to managing her own fears. A mix of Mary Roach and Cheryl Strayed, Holland explores the universal human questions: Why and how do we feel fear? Why does fear seem to spread through groups and crowds like an airborne virus? Most importantly: Is there a cure for fear—and if so, is “facing our fears” really that cure? Eva Holland is a correspondent for Outside magazine, and a former editor at Up Here, the magazine of Canada’s Far North. Her work has also appeared in Esquire, Wired, Bloomberg, Pacific Standard,AFAR, Smithsonian, Grantland, Seattle Met, National Geographic News, and many other outlets. Her work has been nominated for a Canadian National Magazine Award, anthologized in The Best Women’s Travel Writing and The Best Canadian Sports Writing, and listed among the notable selections in multiple editions of The Best American Essays, The Best American Sports Writing, and The Best American Travel Writing. She lives in the Yukon Territory.